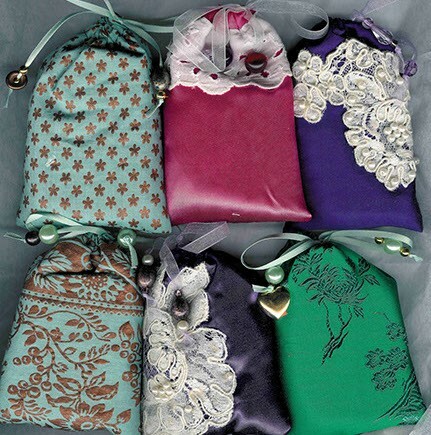 Our Premium Sachets are perfect for gift giving, baby showers or decorating a holiday tree. Our Premium Herbal Sachets are filled with either our Restful Dreams Blend, Pleasant Dreams Blend or %100 Lavender...all designed emit a lovely fragrance that may help aid you on your quest for a night of peaceful slumber. If you have allergies to plants in general, or have any sort of reaction to your Herbal Sachet, cease use immediately. Each of our Herbal Sachets is handmade, just for you. Any variety of fabric may be used to create an Herbal Sachet...and you may send in your own for the project if you wish. All submitted fabrics should be cleaned prior to sending them to us. If you decide to use your own fabric, an email will be sent advising you of instructions for sending your material to Lavender Way.